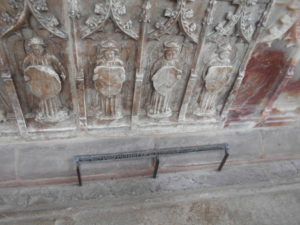 In her last post, Laura introduced us to the elaborate tombs of the Hastings family at St Mary’s priory Abergavenny, and showed what they can reveal about attitudes towards memorial and self-image amongst late-medieval nobles. This time, Laura turns her attention to other tombs at St Mary’s, and the difficulties of studying medieval art in Britain. The Hastings tombs at Abergavenny, and the impressive fifteenth-century alabaster tombs of the Herbert family, that also now lie in St Mary’s Priory, contain spaces for weeper figures on their tomb chests. 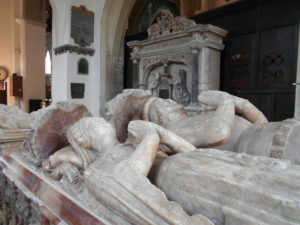 Sometimes, they were shown carrying heraldic shields, as in the angelic mourners seen on the tomb of Sir Richard Herbert and his wife Margaret. Or they might be secular figures, usually family members and ancestors. Such ‘kinship tombs’ formed a powerful display of aristocratic lineage. Studying medieval art in Britain means looking at rare fragments and chance survivals. During the Reformation, from 1535 onwards, monastic houses, holy sites, and the images, sculptures and wall paintings inside them were destroyed, whitewashed over, or removed from the landscape altogether. The Civil War and the Commonwealth in the seventeenth century caused further damage and destruction, especially to ‘royalist’ or aristocratic monuments. It is impossible to know how much was lost. 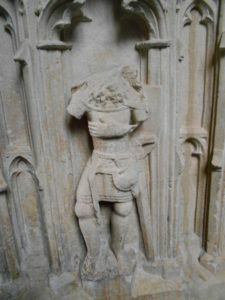 Professor Colin Morris estimates that with the exception of English alabasters, ‘there is more late medieval art at Cologne than in the whole of England.’ This weeper figure from the tomb of Laurence de Hastings, probably intended to depict one of his family members, has been a victim of later iconoclasm. Yet St Mary’s also contains extremely rare and valuable surviving artefacts. 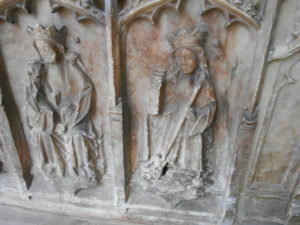 These images of saints and Biblical scenes, found on the alabaster tomb chest of William ap Thomas (d.1446) and his wife Gwladys, was barely touched by iconoclasts bent on removing ‘idolatrous images’. We can clearly see St Margaret standing in triumph over the dragon, and the Virgin seated with the Christ Child. 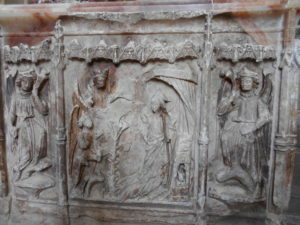 We can also make out the scene of the Annunciation to the Virgin, flanked by angels. In the centre is the lily flower, symbolising Mary’s virginity. The tomb still contains much of its original polychromy. It has been suggested that the region’s close ties to the House of Tudor, or simply the local power of the Herberts themselves, stopped reformers from getting too busy with their hammers and chisels.